Learn rationale and best practices & equipment for harvesting perennial grass biomass. Delaying harvest until after a killing frost helps switchgrass survive the winter and reduces fertilizer requirements in the following year; it also lowers ash content. But it’s difficult to dry a switchgrass crop in the field in the short days of late fall. Use a disk cutter-bar mower and adjust cutting height. Use intensive conditioning accompanied by, if possible, wide-swath drying for the best drying rate. 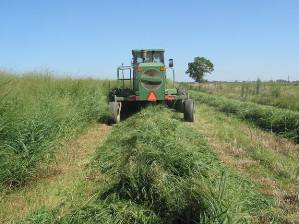 Chop switchgrass with a forage harvester to store in bunkers and bags rather than harvest as dry bales. Plan bale placement in the field before harvest for most efficient use of fuel and equipment. In the Midwest switchgrass should be harvested once a year, typically in the fall after a killing frost. Perennial crops such as switchgrass translocate nutrients, particularly nitrogen (N), from their leaves to their roots in the early fall, aiding winter survival and reducing fertilizer requirements for next year’s growth (Parrish, 1996; Vogel, 2002). Figure 4. Rotary head mowers (disc mowers) effectively harvested this 6-ton per acre switchgrass. Switchgrass is a tall (4 to 6 feet) prairie grass being bred to maximize yield, an important goal for an energy crop. Traditional forage harvesting equipment can be used to harvest high-yielding crops like switchgrass, but machine performance will be different than is typical with forage crops. For instance, high throughputs will reduce ground speed, so field productivity will be lower. Disk cutter-bar mowers are the only logical choice for harvesting high-yielding switchgrass, because sickle cutter-bar mowers will provide very low productivity. Adjust the mowing equipment to accommodate high-yielding biomass crops. Switchgrass should be cut higher than traditional forages, to a 4- to 6-inch stubble height, to trap snow and aid winter survival (Withers, 2009). Also, tire damage has been reported from switchgrass stubble, which can be quite stiff. Cutting higher can reduce this problem, although yields will suffer. Set the cutting height by adjusting the gauge shoes to an upper position (Fig. 1). Tilting the cutter bar toward the horizontal (Fig. 2) will help reduce cutter-bar wear and mitigate damage to the plant crown. High-yielding crops like switchgrass usually dry at a slower rate than traditional forage crops like alfalfa. However, research has shown that switchgrass actually dries more quickly than forage crops (Shinners et al., 2010). That’s because the initial moisture is lower at cutting; its stiff stems produce tall, well-formed swaths that promote air movement; and the leaf surface area is large. Nonetheless, ambient temperatures will be low and daylight length short when switchgrass is harvested after dormancy, conditions that challenge crop drying. The harvest window between dormancy and rain or snowfall that reduce yields will be narrow, so quick field drying is important. Intensive conditioning. Traditional equipment for cutting and conditioning hay was designed with alfalfa in mind. Mower-conditioners, for example, are designed to be fairly gentle on the crop in order to maintain the nutritious and valuable leaves. But switchgrass has a thick, waxy stem that is difficult to condition for faster drying. Since its leaves are actually less valuable than the stems when using the crop for biomass, more aggressive conditioning can be considered. Intensive conditioning hard-crushes the stem between two rolls with very small clearance, then shreds the stem by passing the crop through rolls with differential speed, disrupting the waxy epidermis of the stem. Wide-swath drying. Wide-swath tedding after cutting distributes the crop across the full cut-width rather than in more traditional swaths that may only cover 50 percent of the cut-width. Although not consistent across all studies, intensive conditioning generally was more effective than wide-swath drying at improving switchgrass drying rates. A combination of intensive conditioning and wide-swath drying consistently resulted in the greatest drying rate. Future work will concentrate on machine configurations that can produce simultaneous intensive conditioning and full-width swaths at the time of cutting so that no additional field operations are required. Because of its thick, relatively tough stem, switchgrass resists compression in the baler. Previous research has shown that bale densities of switchgrass in round and large square bales are 10 to 11 pounds per square foot on a dry basis, which is 25 to 33 percent less than with typical forage crops such as alfalfa or grasses. Increasing the density of switchgrass bales would reduce handling, transportation, and storage costs, as well as maximize truck weight limits. Shinners and his team are evaluating a “pre-cutter,” a style of round baler commonly used in Europe that can increase bale density by as much 10 percent, according to initial research. The pre-cutter is a slicing mechanism that sits between the baler’s pick-up and bale chamber. It can theoretically slice material as fine as 45 millimeters, making it easier to pack more tightly into the bale. However, bale densities are still not great enough to insure more efficient transport weights, so more research is required. Switchgrass can be harvested as dry hay with conventional equipment and stored in round or large square bales. Alternatively, switchgrass can be chopped with a forage harvester and stored in a bunk or bag silo. Each approach has positive and negative attributes. Dry bales. Although logistic systems for perennial grasses have focused on field drying followed by packaging in bales, there are problems with this approach. Dry bale systems are costly in terms of labor, timeliness, weather-related losses, energy inputs, and storage losses. Round bales. Storing round bales outdoors can lead to large losses of dry matter because outer layers will get weathered. (Shinners et al., 2010). Bale moisture also tends to be highly variable, depending on weather conditions before harvest. Large square bales. These bales must be stored under cover because they do not shed rainfall. They fill the volume of a trailer more completely than round bales and can maximize payload for transport to the biorefinery (Mitchell et al., 2008). Harvesting switchgrass. Photo by Kevin Shinners, University of Wisconsin. Forage harvester. With a forage harvester, the size of the biomass is reduced at the instant of harvest, possibly eliminating some requirements for processing later. But the material has very low bulk-density, making storage and especially transport less economical. Bunker or silo bag storage for chopped grasses. This may be less expensive, reduce labor needs, and allow switchgrass to be harvested at higher moisture levels. Strategic bale placement can reduce the time it takes to load bales by 38 percent and total travel distance in the field by 40 percent. It can also reduce the total fuel required to handle bales, although only a small amount compared to the fuel required for baling. Round bales of biomass are typically distributed randomly throughout the field. Collecting bales after harvest takes considerable time and equipment, adding to the delivered cost of the feedstock. 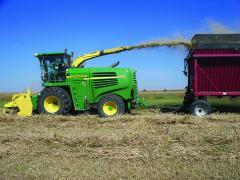 Also, some bale-handling schemes require con­siderable traffic across the field, compacting soil and damaging plants. CenUSA researcher Shinners is investigat­ing strategic bale-placement schemes to improve bale-handling logistics by conducting time and motion studies for various strategies. Handling schemes have included one- and two-person bale retrieval with traditional tractor loaders; single vs. multiple locations of the bale-hauling trailer; and use of specialized bale-moving machines. The cost of reducing the size of the biomass before converting it to biofuels or bioproducts is a significant fraction of the total cost of a feedstock. To accurately estimate the delivered cost of perennial grass biomass, it is important to calculate the energy expended to harvest and process it. CenUSA researcher Shinners and his team have quantified the energy required to reduce the size of biomass either at the time of harvest or post-storage. Three size-reduction systems were used: round baler with pre-cutter, forage harvester, and tub grinder. Using a pre-cutter on a baler increased bale density by 0 to 10 percent and increased specific fuel consumption by 10 to 23 percent, with an average of 17percent. A wide particle-size distribution resulted from use of the baler pre-cutter. Size-reduction by chopping with a forage harvester (Fig. 3) or by tub-grinding produced similar particle size, which was much smaller than with the baler pre-cutter. However, the combination of baling followed by post-storage tub grinding required more than twice the energy compared to chopping with a forage harvester. Although harvesting by chopping provides a size-reduced feedstock, the material has very low bulk-density, challenging the economics of storage and especially transport. Shinners and his team are working on ways to store the chopped feedstock in high-density “modules” and on systems to maintain the density during transport. That would eliminate the need for re-densification and shrink transport costs. Switchgrass grown as a biofuel will survive the winter and require less fertilization the next year if harvest is delayed until after a killing frost. Getting a switchgrass crop to dry in the field, however, is difficult in late autumn. There are strategies to speed up switchgrass drying and to successfully harvest a crop, including using the right equipment, adjusted for the crop; using intensive conditioning, and storing in bunkers and bags, if possible. This Fact Sheet is part of the CenUSA Feedstock Logistics: Harvest and Storage Module. CenUSA Project Resources provide information on the opportunities and challenges in developing a sustainable system for the thermochemical production of biofuels from perennial grasses grown on land marginal for row crop production.